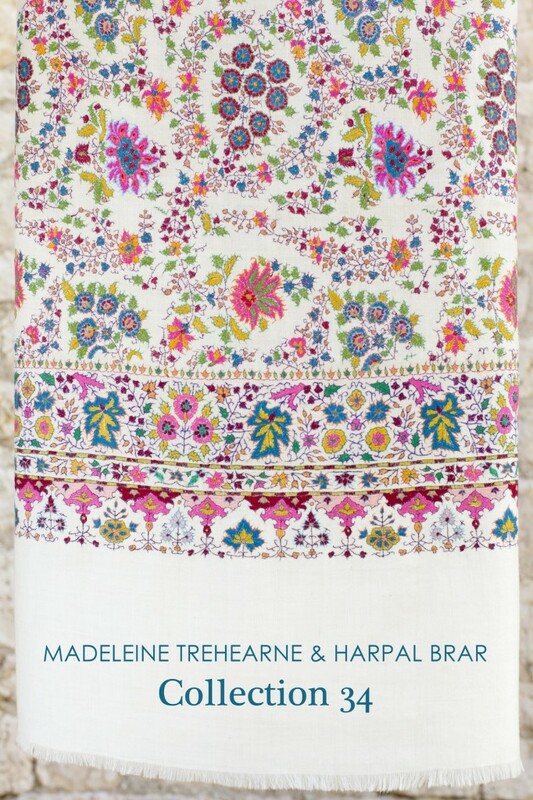 A few weeks back we were in France shooting shawls for Trehearne and Brar and Vogue (UK). 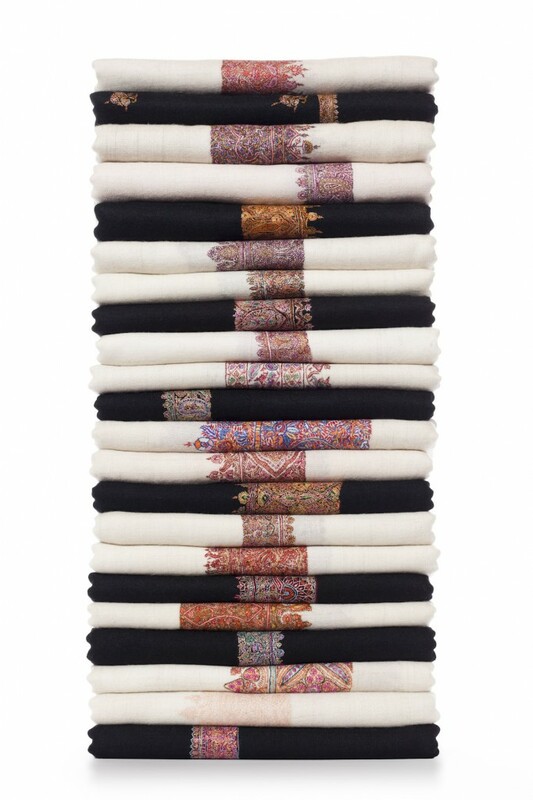 These are not your everyday shawls, these are genuine Kashmir shawls, hand woven from authentic Pashmina cashmere. They take months to make and retail from £400 – £6,500. (Yes I’m thinking the same, thats the price of the contents of my camera bag!). I had a pair of Bowen lights with me but my plan was to utilise the brightest light of all, the Sun. Armed with an array of reflectors I was able to bounce and defuse the sunlight to suit the photo. We set up in an outdoor area that was surrounded by walls, which provided us with a shaded area where we could handle the shawls as they were sensitive to prolonged exposure to sunlight. There we were able to bounce the sunlight in to our work area. 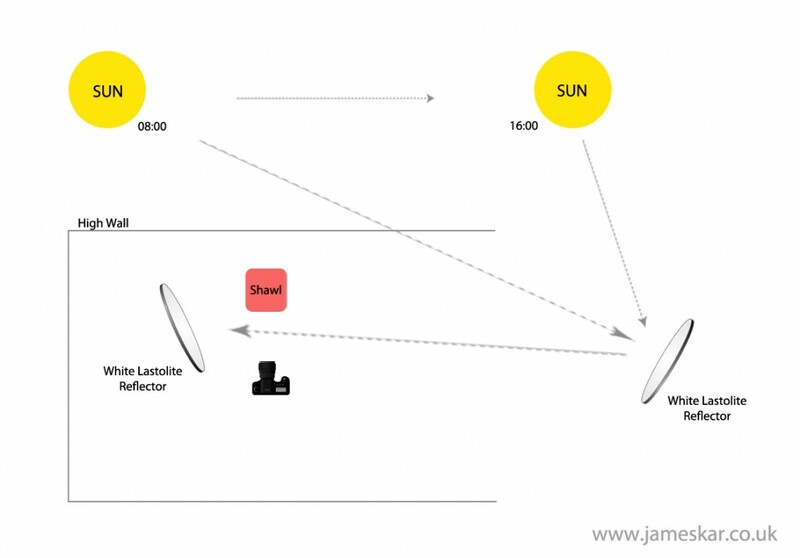 My attempt of a lighting diagram to help give a better idea of the set up. 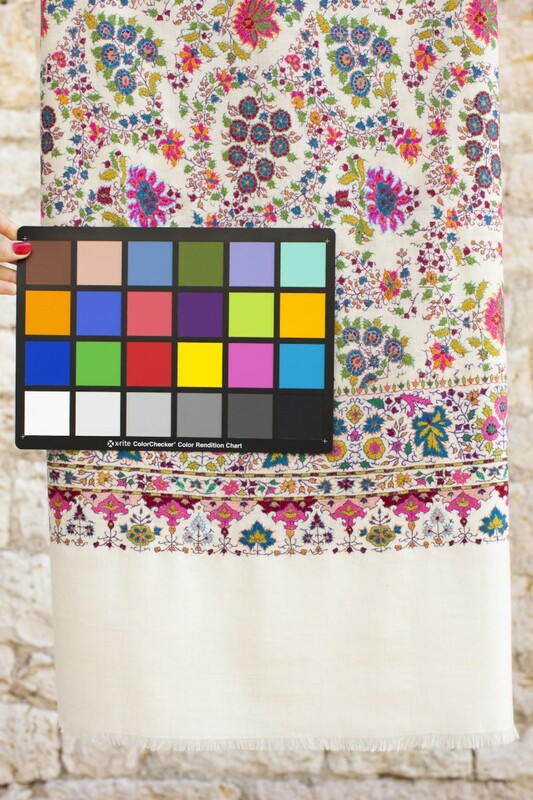 We shot a number of different shawls out in France, with no more than 4 shawls in each photo. For the tech geeks reading this we used, my favourite, the Canon 5D MrkII and the 50mm 1.2L. For the reflectors we used Lastolite. Back in London we had around 170 shawls left to photograph and 8 pages in the brochure to fit them in. We stacked them on top of each other, about 23 shawls to each pile. Sounds simple enough but simple was far from how it played out. 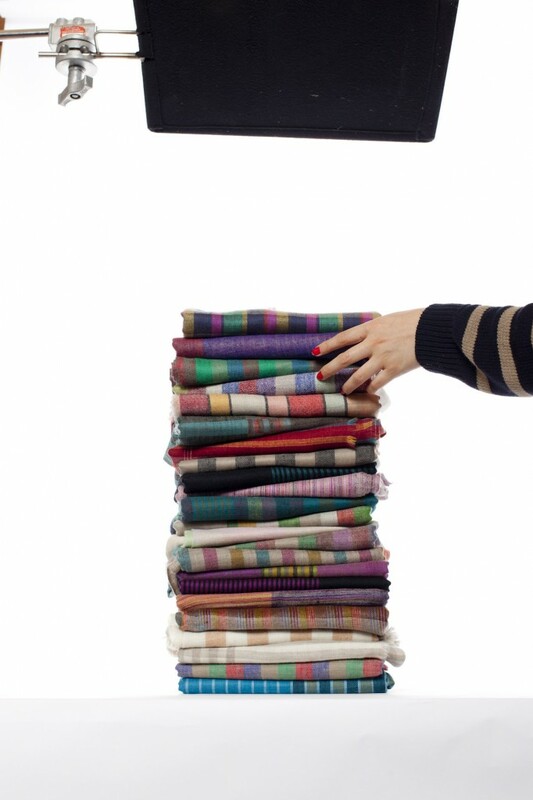 Imagine dealing with 23 very delicate shawls, each carefully ironed, steamed, neatly folded then balanced on one another. Which, if left for more than a few minutes would slowly flatten the ones at the bottom of the pile. Then as the stack got taller it would lean a bit the left and then to the right and when you’ve finally got it right it would collapse and you have to go back to the beginning. Two of the photos that went to print were taken seconds before the whole stack came falling down. We found propping a 2L bottle of water behind the stack helped to hold it up.